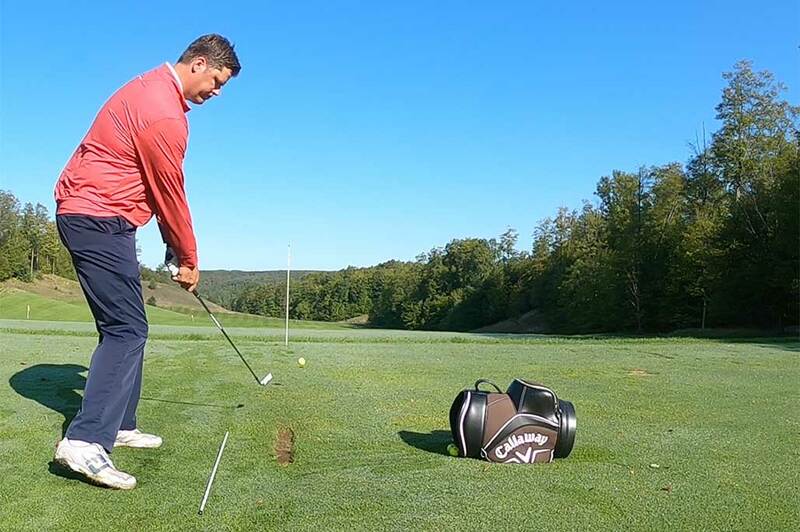 Director of Instruction Joe Charles heads up the Treetops Golf Academy, a Golf Channel Academy and offers a simple how-to on setting up a practice station. I have the distinct pleasure of having the location of my office on the Jones Masterpiece Driving Range at Treetops Resort in Gaylord, Michigan. This gives me the ability to occasionally, between lessons, watch both good and bad golfers practice on a daily basis. I have also been fortunate enough to work at multiple golf clubs where PGA Tour players practice and play between tournaments. Over the years I have noticed some very obvious things that good players do, and bad players don’t do when they hit balls. As a golf instructor, I feel that not only am I tasked with teaching golfers the best technique to help them play better, but also to motivate them to want to practice and teach them how to practice. Step 1 – When picking your target on the range take a stick out and lay it on the ground pointing at that target. Now, this seems pretty obvious, but most people don’t even pick out a specific target when they go hit balls. In my opinion, this is the main reason behind the old line “I hit it great on the range, but then everything changes when I get on the course.” Well that’s because it’s easy to hit a ball onto the range, try picking a smaller target, say the size of a green or fairway and trying to hit that instead. Step 2 – When taking your stance make sure that the stick is equal distance between your feet and the ball. One big misconception with alignment is that your feet are supposed to aim at the target. The feet are actually supposed to aim on a parallel line to your target line. Step 3 – Take out a second stick and place it in the ground standing straight up between 5 and 7 yards out in line with your target. This is very important, because what you will start to notice is your tendencies for the initial direction of your golf ball. While you are practicing, try to take notice which side of the stick the ball tends to pass by based on the type of shot you are trying to hit. This will give you a lot of feedback on what the club face is doing during the golf swing which is the main thing controlling the initial direction, or azimuth of the golf ball. Step 4 – Make a divot line. This is probably the most frustrating thing for golf professionals, not to mention course superintendents. When most amateurs practice they find the best piece of grass possible, prop the ball up on that grass and then hit it. This creates divot patterns that destroy practice tees. It also makes it almost impossible for the player to aim correctly and to prepare for the course (unless the player does that on the course also, which is a whole other article). Instead – try hitting the ball and then placing another ball directly behind the divot from the previous ball. After awhile you will notice a line forming. Now this line will give you a ton of feedback on what the club is doing through impact. I could make an argument that we could get information on all 5 of the ball flight laws simply based on looking at that line. Things like, angle of attack, the path the club is traveling on, club face angle at impact, etc. The better you get, the straighter and more parallel to your alignment stick the line should be. When you are ready to aim at another target or switch clubs, simply move your sticks and create a new line.